I was surfing the web today and it seems many people are asking questions about how to install APK files. I would like to give my 2 cents on this topic. 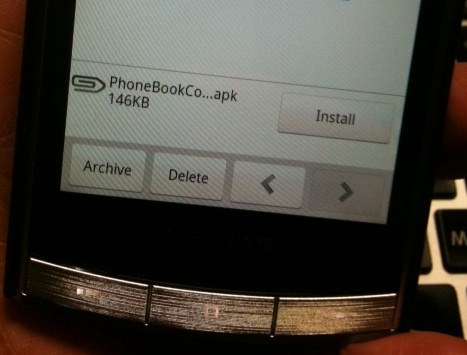 As you probably already know, Android applications have APK file extensions (i.e. game.apk). Many pre-installed apps are located in /system/app folder. When you install new apps, its installed under /data/app folder. The easiest way to install such app (APK file) is simply to visit android market and download/install the app. But how do you install APK file thats posted on a web site? If you are an android developer, you already know how to do this with "adb install". Thats how I typically do it too to test my apps. But most people do not have android sdk installed and need alternative method. I have been using either dropbox or Gmail. Gmail app: Email the APK file as an email attachment to your android. Make sure to open it with "Gmail" app. Some mail clients will only offer to save the attached APK file to your SDCARD. But if you are using Gmail app, the APK file attachment will have an "Install" button. Just click "Install" (see pic below). Hope this helps!! !